Blake Morgan attended the first MMF meeting in New York so we asked him some questions about how it went and what jewels of wisdom the assembled brain trust imparted to the audience. For those of you who don’t know him, Blake is the driving force behind the #irespectmusic movement which has been called the largest grassroots artist rights movement in the history of the music business. If you’ve got a manager who attended, check your expenses invoices, kids. What was the purpose of the MMF meeting? How many showed up and what was the topic? I’d say there were about 45-50 people there, with five panelists. 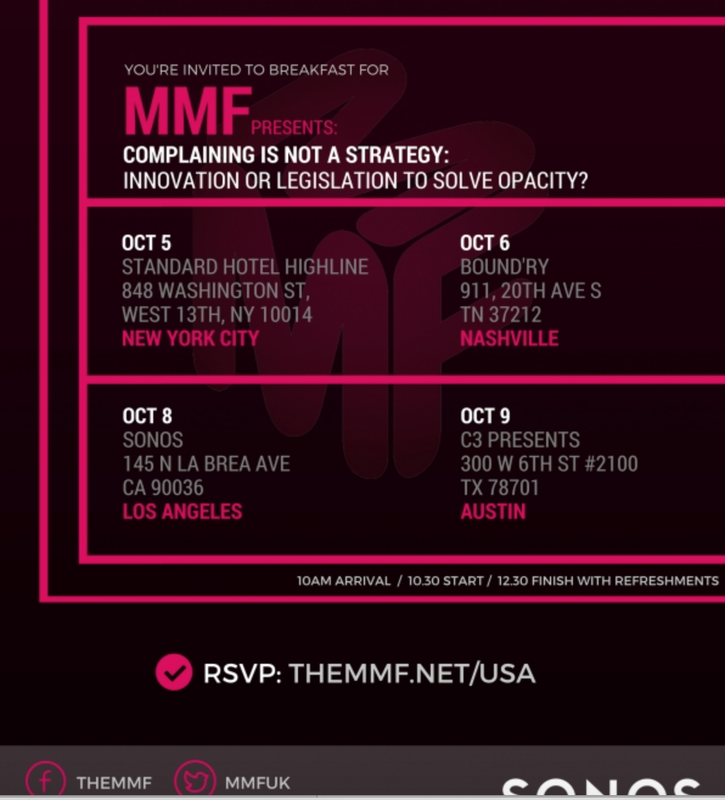 As for the purpose, I’m really not sure…outside of telling us how hard the MMF is fighting the “good fight” for music makers, the only seemingly tangible theme to the meeting was to inform us all how terrific Spotify is. I’m serious. Do you get the impression the MMF is trying to play nice with the artist rights groups like the Content Creators Coalition and the #irespectmusic movement? If by “play nice” you mean by “completely ignoring them,” then yes. Seriously, there was a repeated notion put forward at the meeting which was, “if only artists would ever step up.” Members on the panel––on several occasions––called for artists to “get in the game,” because that’s what would “really change things.” “There is no artist organization out there, and we need one,” one panelist said. That’s an actual quote from a panelist (I was taking notes). You know what? If they want to belittle the Content Creators Coalition and their efforts then that’s their choice, but the truth is they ARE an artist-driven organization that is trying to do good in this fight, and do good in the world. Pretending that they don’t exist is insulting to them, and it’s insulting to me, too. What the Content Creators Coalition is trying to do requires a process that is messy, and it requires courage. From an #IRespectMusic standpoint, I’d love to hear these ignorant and dismissive MMF shills say “artists should step up” to the faces of the tens of thousands who have joined together––many of whom are kids, parents, teachers, students, and yes, members of Congress as well––fighting side by side under a positive, righteous, and effective banner which has grown to become the largest grassroots artists’-rights movement in the history of Amercian music. Talk about insulting. Were artists invited to the meeting? Anybody there who you knew? I really don’t know if artists were…I was invited through a friend, and indirectly, and when a show of hands was asked for regarding whether there were artists in the audience, I raised my hand along with two others. No more than that. What was the general gist of the speakers? Was this another Spotify love fest like the last one? Given that these were managers, how did they address the topic of royalty payouts from streaming services? The kool-aid narrative of “Spotify and streaming actually pays all this money, but it never gets to artists because of evil labels” was pervasive. Transparency to them, it seems, doesn’t include the understanding that labels can’t pay artists money that never comes in from services in the first place. It was great to meet you several years ago in Toronto at CMW- and I love your work for I Respect Music, etc. You are awesome and I count you as a colleague and doer of great work. I have spent much of the last 20+ years working hard on behalf of the IMMF and MMF -US. PLEASE send out a correction on several fronts to below.My suggested corrections in red. 1) Its MMF-UK NOT MMF. Each country chapter stands alone (and there are almost 30 around the globe now) legally for solid reasons,. IMMF is the umbrella group for the world. I get along well with MMF UK leaders and have interacted with them and participated at numerous activities in UK Europe and here with them for many years. and I have mentioned it to them a few times. They do mostly great work in UK and abroad and its wonderful that they held these recent meetings-many of which MMF –US member managers have or will attend. 2) However its NOT the first time they have held them in US . Thanks ,please respect your professionals in the US MMF (been around over 20 years now) organization and its sovereignty as we do to other countries. Kind thanks, keep in touch-call me anytime if you want to discuss this or anything else.